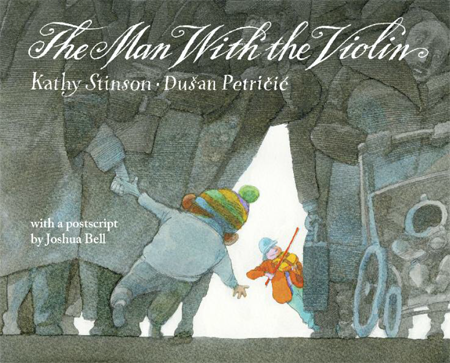 Our BLG book this week was The Man with the Violin written by Kathy Stinson and illustrated by Dušan Petričić Thank you to Lisa, our newest BLG reader for sharing this beautiful book with us! How lovely to have this book come into our classroom – it is already easily one of my favourite picture books for 2013 and both author and illustrator are Canadian! This book is also especially meaningful for students because music is such a large part of many of their lives. Some students are fortunate to be part of the St James Music Academy (SJMA) after school programs and play a variety of instruments. Every week all students sing joyously with Jill Samycia as part of the outreach program of St James Music. Music is magic. We need no convincing! But this beautiful book reminds everyone about the power of music to touch us, if we only let it in. Students were intrigued to hear how this book was based on a true event where musician Joshua Bell took his instrument into the metro in Washington D.C. for a free concert. Dressed in regular clothes and with no special signs, he just played. And sadly, he was mostly ignored. After 43 minutes of play, only seven people stopped to listen. Nobody clapped. His open violin case had only $32.17 even though people all over the world would easily pay $100 for a ticket to listen to him play on stage. Joshua did notice children try to stop and listen but they would be hurried along by their parents. Kathy Stinson tells the story of what it might have been like for one particular child who experienced hearing Joshua Bell play in the metro station. With captivating illustrations by Petričić, this is an important story of what we miss by not being in the moment. How many beautiful experiences are lost on us as we rush through our days? Gracie rated this book 4/5 and writes: I kind of liked this book. It was pretty good. My favourite part is when the man played his beautiful music. Why did the famous violinist dress up as anybody? I play violin. I was surprised when no one listened to that pretty music. Andrew rated this book 5/5 and writes: I have a connection because I play the violin too. I noticed the Mom didn’t notice anything. I have a connection to SJMA. When I went to the Surrey Flea Market, I saw a man playing his guitar. Yesterday, my violin teacher went and played in the concert. Kala rated this book 5/5 and writes: I like when Dylan was spreading the colour. He was listening and when others stared at him, they all started to feel the music from him. The Mom was just kept on going. Dylan stopped and looked at Joshua Bell. He did nothing and just standed there. But the Mom grabbed him and kept walking. When he left, he was still listening. Hyo Min rated this book 5/5 and writes: My favourite part was when he followed the music. I love the book! It makes me feel happy. I think his Mom is not listening to the music. Maybe she should listen instead of rushing. Arianne rated this book 4/5 and writes: Dylan wanted to stop to listen to the music. Mom told him we have to go home now. Dylan pulled his Mom toward the music. Why did his Mom not listen? His Mom didn’t notice because she was rushing and maybe thinking she needs to cook. Jorja rated this book 5/5 and writes: I love it because it was beautiful. Why did the boy want to stop?I wonder what the music sound like? I like the colours. Kevin rated this book 5/5 and writes: I know that Dylan came home and listed to the music. I know that Dylan is peaceful and his Mom is in a rush and a hurry always. What kind of violin does the man play? I can’t believe that only kids came to hear the music and only pay him $32.17. I love that some of the pictures are back and white. Ava rated this book 3/5 and writes: I have a connection because I play the violin. Dylan was the only one to stop to listen to the music of the violin. My favourite part of the story was the pictures. Dylan was the only one who was colourful. Shereese rated this book 5/5 and writes: I think the book is a nice book. My favourite part is when he plays the violin. Dylan stops to listen to the violin, to the beautiful song. Giovanni rated this book 4/5 and writes: Dylan liked the music. He wanted to stop and listen. Heman rated this book 3/5 and writes: My favourite part is when Dylan and his Mom was listening to Joshua Bell songs in the radio. I connected like I play violin just like Joshua Bell. I noticed that the illustrator made the pictures black and white except the things that Dylan was noticing. I noticed that Dylan was floating when he was listening to the music. This entry was posted in BLG Reads this week and tagged BLG Reads, Dusan Petricic, favourite illustrators, fiction, Joshua Bell, Kathy Stinson, picture books by carriegelson. Bookmark the permalink. Hi Everyone! I just read this book, too, and because of your teacher’s recommendation! I agree that it is a beautiful book to see, and also to imagine the music. Don’t you think the illustrator made the music come alive through the colors? I am curious about the music too, and would love to hear it! Thank you for all your reviews! This is the second post today that I’ve read about this book. It is definitely going on my list of wanted books!